Utopia, un endroit pour profiter et se détendre, dans une belle maison. Un moderne, presque neuf, 2 Bedrom 2 salles de bain d'un niveau Gem, Avec 360 Ft. de bord de l'océan. Dès que vous entrez dans la porte, vous avez ce que "wow" sentiment. Une grande salle avec baies vitrées donnant sur le bassin d'Annapolis. Vous êtes dans le centre de l'anse de Thorne, avec des zones entretenus autour de la maison pour la jouissance paisible. Les planchers sont en érable, le plafond est de 10 pi. De haut avec des colonnes ou des murs. Les luminaires sont européens, tous les haut de gamme. La cuisine dispose d'appareils en acier inoxydable, comptoir de granite, et un 36. Professionnel cuisinière à gaz. Tout ce que vous avez besoin est à portée de main. La chambre principale dispose d'un lit queen size, avec vue sur l'océan. La deuxième chambre a deux jumeaux. Toutes les armoires sont magnifiquement intégrés. Il ya aussi un futon double dans le salon. Les salles de bain disposent d'appareils haut de gamme. Il y a WI-FI ,, avec la télévision par satellite, et un système stéréo. A l'extérieur, une grande terrasse et un choix de places assises. Un barbecue est fourni. Belle douche carrelée européenne avec puits de lumière. Puits de lumière dans la moitié de bain ainsi. Beautiful building in a stunning location. We also appreciated how well appointed the building was. Great location with unforgettable views. The air was sooo good. The general area is central to Canadian history. It also enjoys a special and unique and complicated landscape/seascape. The area is just wonderful for walking hiking or just sitting and staring and breathing. About a 20 minute drive from Annapolis Royal which has any supplies you might need and a really iconic Farmer’s Market. Appreciated how well equipped the kitchen facilities were. Somebody there likes to cook. Fun DVD collection as well. In general the place is really well equipped. It was interesting. It’s been my experience that on-line photographs describing potential rental properties generally make the place look a little better than it turns out to be. But this building was actually better than the photos. We loved the place. We loved the location. Super well equipped. And the owner was efficient, professional and easy to deal with. Thanks for taking the time to write your review. It's much appreciated. Just a few things though: plug plate in laundry room unsecured to wall, waterproof shelves and seat in shower for toiletries, instructions for TV, garbage disposal, and oven. Kitchen was well equipped except for lack of dishwasher. Rusty pot lights in covered porch should be replaced with non-rusted type to increase 'saleability' of the home. No curtains on single bed room was a bit disconcerting especially when sharing the house with friends. We enjoyed the daily local clam-diggers and seal sightings. Thanks. Some helpful hints. The house is a European design and it's noted in the description that there is a large sink, and no dishwasher. Instructions for the oven and garbage disposal are in the binder that is on the kitchen table when guests arrive. This property was so much more than I expected. The view was fantastic and the back patio was so peaceful to sit out and watch the water or the "clammers" looking for clams on the mudflats, depending where the tide was. The house was spotless with a great kitchen. Loved the property. Would definitely recommend. The vacation home is beautiful, very artistically decorated, comfortable, the view is particularly awesome. We stayed five nights as it was the minimum nights required. However the location is remote, so it is not a suitable base if you plan to visit many places. It is perfect if you just want to relax in front of ocean, have some quality family time etc. The main drawback which affected our otherwise perfect holiday was the lack of dishwasher - doing dishes by hand while on holiday was not part of the plan! Maybe it was our own fault that we didn't read the details, usually assume that vacation homes will have dishwasher! This is the first review that has expressed any concern. Yes the house is 15 min. from Annapolis Royal, but most guests enjoy the privacy, in a beautiful house with 10 ft. ceilings and gorgeous ocean views from a bank of doors on the patio, not to mention access to the beach. While there isn't a dishwasher, there is a well provisioned professional kitchen which comes with a sink and drying rack. If the five night stay in the middle of summer is a problem, there are plenty of B&B's in renovated Victorian houses in town which can accommodate a shorter period. As for the damage deposit, we were out west visiting our children and have just come back to check the house. No communication regarding this was received through VRBO from the guest. Thank you. We stayed 5 nights exploring the area and doing day trips. We easily drove to Lunnenburg and Mahone Bay. We also went whale watching from Brier Island. The house is super nice. High ceilings, wood floors, lovely rugs and furniture. 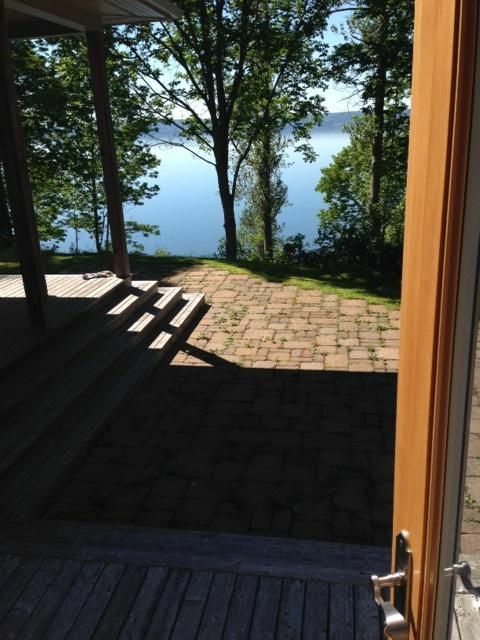 The huge glass windows and doors all across the back of the house look out over the Annapolis Basin. It's amazing to watch the huge tides come and go. You can walk down to the water but the lowest path was washed out and only the guys went down. This house has 2 bathrooms with sink and toilet. One has a bidet. The shower is in a seperate tiled room with skylight. It was nice and worked out well for us. The master has a queen bed and doesn't have drapes which makes it great to watch the moon over the water but very bright in the mornings. We had a problem finding the house. The number was not visible. The house is about 20 minutes from a store down a 2 lane road, they don't sell alcohol on Sundays and close earlier than in the US. The house was supplied with everything we needed except food. Teresa the housekeeper was very helpful. We had a great time in this house and strongly recommend it. Annapolis Royal est un, heureux, ville sûre historique incroyable, en vedette dans le magazine MacLean comme le premier 'un des dix endroits que vous devez voir. Il dispose d'un marché public les samedis, de grands restaurants, des boutiques, un des premiers forts au Canada et un jardin historique public. A proximité se trouve un marché de poissons dans de Parker Cove, où vous pouvez obtenir de renommée mondiale pétoncles et homard cuit pour vous! Est d'environ 30 miles Digby où vous pouvez aller observer les baleines.